Is it the weekend yet? I’m not sure why, but this seemed like a really long week. It may have started when my younger daughter – upset at her sister for trying to make her take a shower first – ripped the towel hook off the wall (and made a nice big hole in the wall) when her older sister asked her to hand her the towel. Or when my older daughter called from school because her ear hurt, when I was just about to leave work to take my younger daughter to the doctor. Or when I got an email about my younger daughter’s school that was in lock-down because of a man who robbed a bank 15 blocks from the school – and actually escaped. Or maybe when I dumped rice all over the my office, and I had to pick up the pieces one by one before I stepped on them and smashed them into the dark brown solid colored carpet – who thought that color was a good idea? I know these are all little things (ok, maybe not the bank robber), but they take their toll. I am ready for a break. I am ready for a drink. When it comes to drinks, I am definitely partial to cucumber drinks. I have posted my share on this site, and each one has been delicious in their own way – but this one was exceptionally good. This one was actually healthy – there was no peeling of the cucumber – you just cut off the ends, and put the entire thing in a blender. 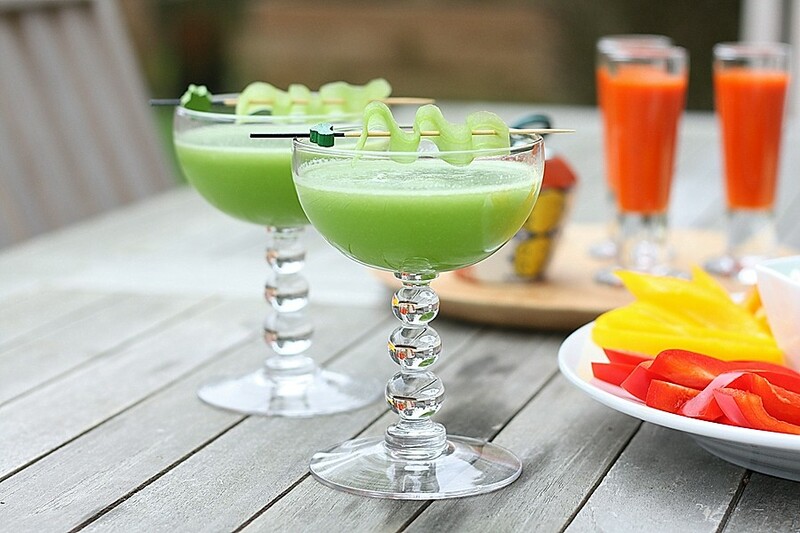 After you strain the solids, you end up with this beautiful green cucumber juice – crisp and clean. Wow. So, for those of you who don’t drink alcohol – you can still enjoy this refreshing drink, the cucumber juice with lime juice and simple syrup is definitely a treat. Better yet, you can get your kids to eat their vegetables, and they would never in a million years believe you that this was good for them. My mind is starting to churn…there is a lot I can do in this space. Here’s to the weekend – that is not here yet, but soon enough. For those of you on the east coast – blend your cucumber tonight, before the storm hits. You will thank me later. Stay safe and warm everyone – and Cool as a Cucumber! Mix all ingredients together in a shaker with ice. Serve in a martini glass with a garnish of cucumber (peel a long strip of cucumber and fold it onto a toothpick). Thanks Angie!! Yes, that green color really gets me every time! I agree with you, little things here and there can adds up….it’s always nice to have a drink and forget all those little “troubles”. :) Wish you and your family a beautiful weekend. Thanks Amy – I hope you have a good weekend as well! It’s Friday! Sounds like you need a weekend. I’m with ya. We’ve had something planned/going on every night this week (including tonight). I’m ready to sit. Sitting with this drink would be all the better! Yeah!! Kristy – after last weekends food challenge – you really need a relaxing weekend!! Thanks Brenda – so nice to hear from you!! I hope you are enjoying your time at home with the kids! Thanks Marla – your Honey Bee Martini looks amazing, I can’t wait to try it! !